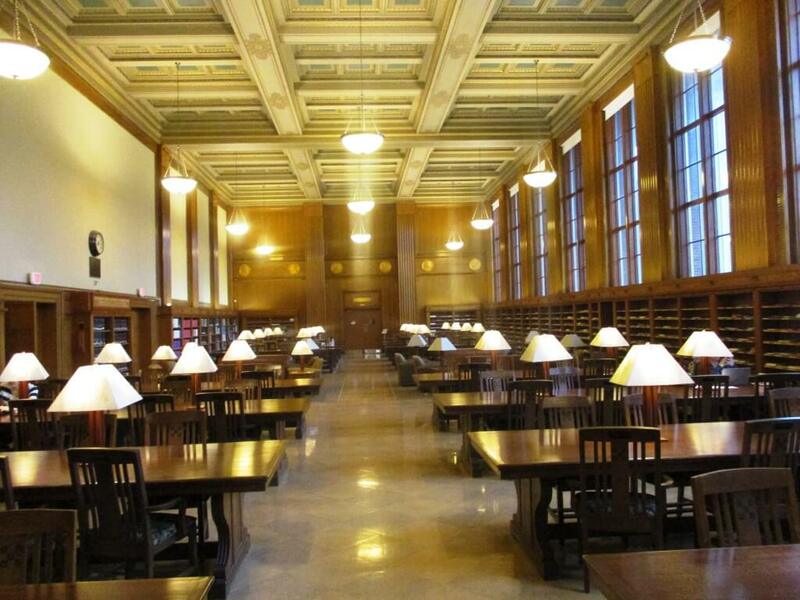 The Martin E. Messinger Periodical Reading Room. Except where indicated, photos by David Kramer. 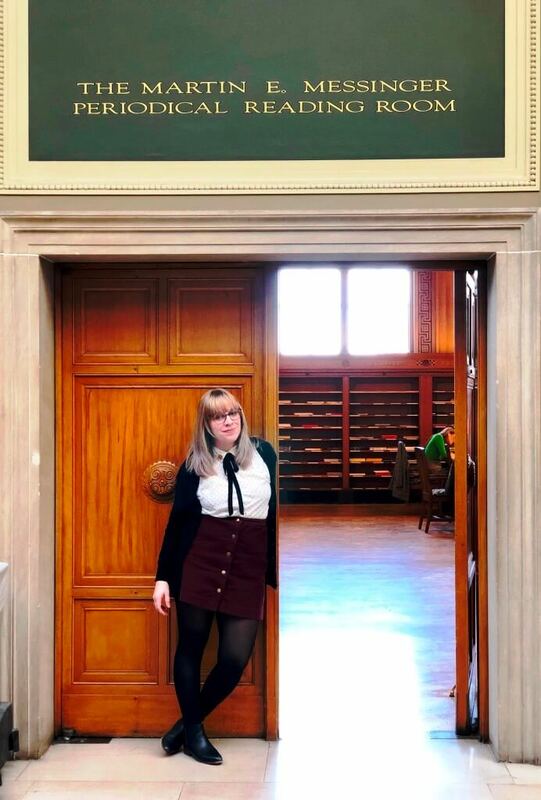 In A periodical lover’s dream at the Rundel Memorial Building, we explored the gem that is the periodical reading alcove of the Arts & Literature section of the Central Library of Rochester. 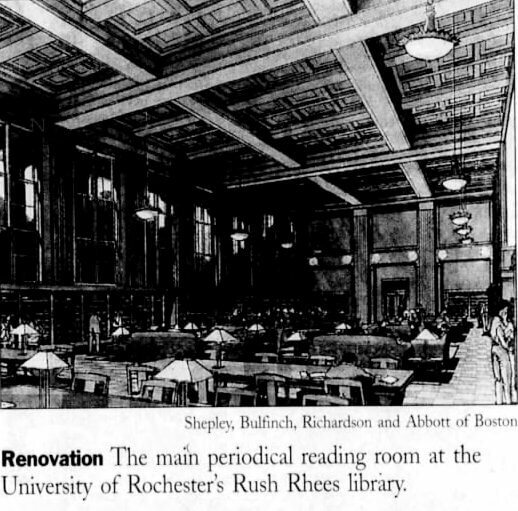 Today, we explore another Rochester bibliophilic jewel: the Martin E. Messinger Periodical Reading Room in the Rush Rhees Library at the University of Rochester. 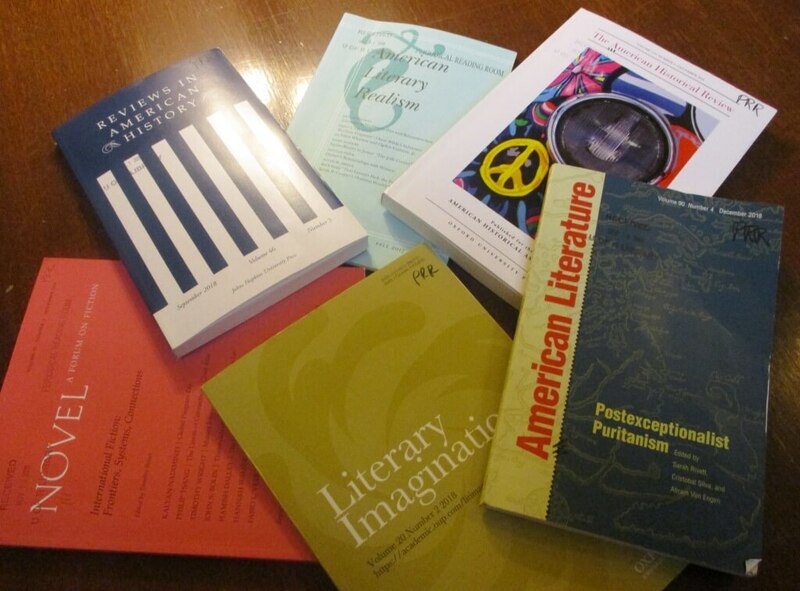 In Print is not dead yet at the University of Rochester we took a glance at Messinger. Today, with the help of Lindsay Cronk, Head of Collection Strategies, University of Rochester River Campus Libraries, we take a fuller view. The newest upgrades to our historic spaces are the Messinger Graduate Studies. 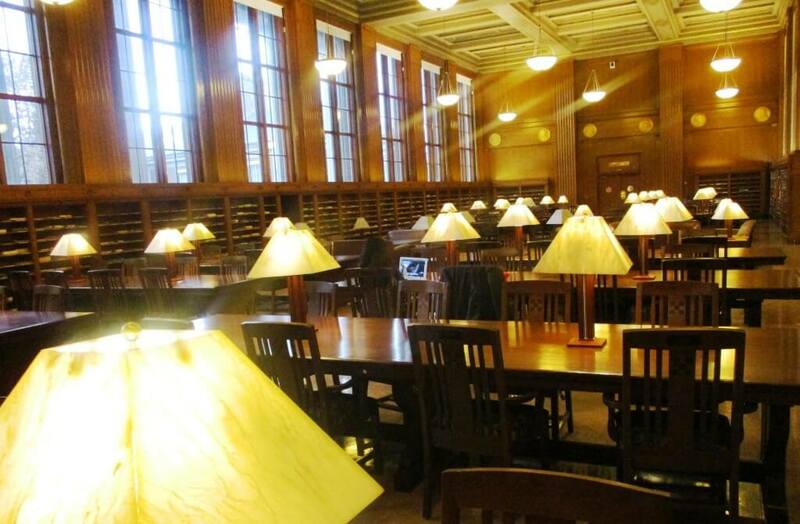 Located off either end of the Messinger Periodical Reading Room, these beautiful rooms have been designed to meet the specific needs of our graduate students. The studies provide a quiet retreat where they may study and relax. The centerpiece of the North Study is a stained glass window donated by the Friends of the University of Rochester Libraries. The window features the phrase Bibliotheca Docet or “The Library Teaches.” These beautiful spaces previously housed newspapers, microfilm readers and government documents. 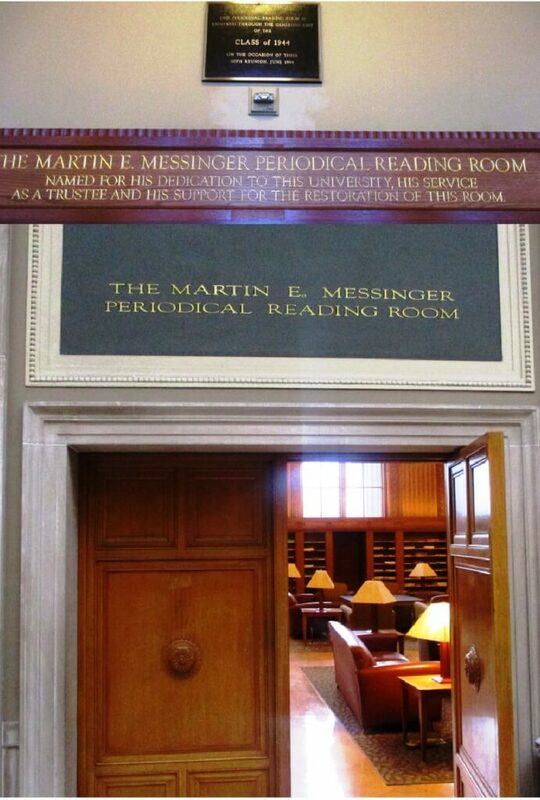 The Messinger Graduate Studies and Periodical Reading Room were named in recognition of the generosity and continued commitment of Martin E. Messinger, Class of 1949 and were dedicated May 12, 2010. For me, Messinger is a cornucopia for tempting, teasing, tickling and then satiating our intellectual appetites. In one small section of the M’s, in The Mark Twain Journal you can discover why Twain found Buffalo’s “Coal Question” of the 1870s so riveting, hear what the Command and General Staff College says in its Military Review: The Professional Journal of the United States Army, review “A review of Planthoppers (Hempiptera Fulgoroides) of the United States” in MEMOIRS OF THE AMERICAN ENTYMOLGY NUMBER 50, in the Mennonite Quarterly consider “Henry VIII’s March 1535 Proclamation against Anabaptists Reconsidered” or just contemplate Modern Philology. To learn more, I turned to Lindsay Cronk who answered a few questions. How many publications and of what types are on displayed in the collection? How are publications chosen and/or discontinued? Are all back issues kept in the stacks? At the River Campus Libraries, we approach the Messinger periodicals as an opportunity to display titles curated for intellectual serendipity. They are meant to be thumbed through, handled, and enjoyed. It’s an inspiring yet informal quiet study area, and the collections there reinforce that character. The Messinger Collection evolves with the input of our team, including Acquisitions and Metadata specialists alongside Humanities and Social Sciences librarians, who work together to curate in the space at any time. Because we are continuously reviewing titles, we do not have an exact number for the space. Most back issues are bound and sent to the stacks, though some popular titles are maintained in digitized backfile format to conserve space for other materials acquisitions. As you might expect given our commitment to preservation, space is at a premium, and we take pride in our robust print and online serials collection. The Messinger Room is a popular study space for undergraduates and there are areas reserved for graduate students. Based on your observations, besides students and faculty, does the Room attract members from the non-academic community? What items might have a more general appeal? In general, Messinger is used by University of Rochester community members, though we are always glad to have visitors! The room is a gorgeous and quiet environment. Some periodical titles can be considered leisure reading. Among those you’ll find some of my favorite titles to browse, Film Quarterly, Esquire, and Forbes alongside more traditionally academic content. That said, scholarship and inquiry often demand a wide variety of inspiration and material. So while portions of the collection have more general appeal, all of it is considered to be valuable. For those looking for newspaper content in print, most of that is kept in the Gleason Library. In the last 15 years or so the digital revolution has drastically transformed the archival landscape. What are some of the most significant impacts on print academic journals? As print journals continue to disappear, what might the current periodical section of the Messinger Room look like in 10 or 15 years? The digital revolution in academic publishing has been an inconsistent transformation that is not retroactively complete. Taking a journal online is not an inexpensive or simple proposition – and some journals haven’t made the leap. Further, much of what was published prior to the explosion of online publishing has not been digitized and may never be digitized. We are committed to making sure the knowledge that has been communicated, whatever its format, is available to inspire the scholarship and creativity of our community. From a collections standpoint, a lot of my work focuses on strategically ensuring the space for and accessibility to scholarly content whatever its format. At the River Campus Libraries we are actively dedicated to ensuring the preservation of print serials through a variety of channels. We participate in a variety of repository partnerships focused on academic journals, notably the Center for Research Libraries (CRL), Eastern Academic Scholars Trust (EAST), and HathiTrust. We collaborate with other academic libraries in acknowledgment of the fact that we cannot solve what in libraries is often short-handed “The Preservation Problem” alone. It’s too big a challenge, and we stand a much better chance of taking it on collectively. This commitment to ensuring access to the scholarly record is a shared goal of many libraries, and benefits our local community as well as the greater global community. The Messinger Periodicals Reading Room is a treasure, and I am confident that community members will be enjoying it (and some print periodicals) 15 years from now. River Campus Libraries understands our community likes to read and research in a variety for formats, and we do what we can to meet needs with our budget and space. It requires strategy and advance planning. We are dedicated to serving information omnivores at the University of Rochester. What do you like about the Messinger Room? I like being able to peek at the scholarly process — seeing people using the library to find the content they need and create new knowledge is the reason I do what I do. 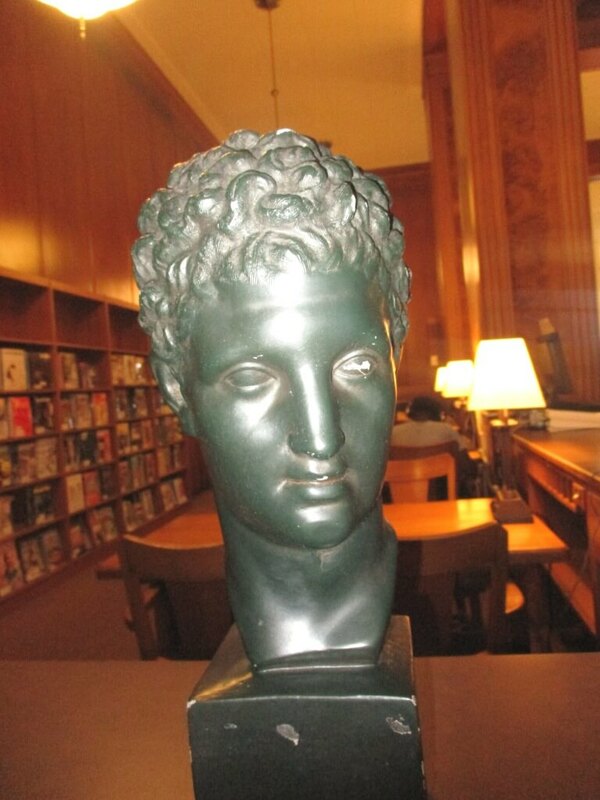 The Messinger Periodicals Reading Room offers a wonderful glimpse into that. Libraries are knowledge engines in this way, and the Messinger Reading Room provides a lot of fuel. More specifically, one of my favorite spots is actually the porch off of the Messinger which is currently closed for the winter. During other seasons, I often find students and faculty enjoying the view of the Olmstead landscaped quad and Interfaith chapel. It’s a stunning and inspiring space inside and out. In the summer, you may find me in one of the Adirondack chairs, working on the materials budget and taking occasional breaks to enjoy that incredible space myself. Postscript: When at Messinger, I tend to gravitate to the American Literature and History journals. In recent years, I’ve fallen behind the cutting edges of my field. Feeling oddly liberating from that cutting edge life, I enjoy browsing the scholarship, discovering if I can still follow the arguments. For example, in American Literary Realism I met an old friend, Brook Thomas, who first helped me navigate the murky poststructuralist discourse called New Historicism. In The New Historicism and Other Old-Fashioned Topics (1991), Thomas displayed his signature non-jargon-laden style, taking aim at the theoretical overgeneralizations and historical misreadings of his colleagues. In “Adventures of Huckleberry Finn and Reconstruction,” Thomas is his usual lucid and pungent self over 25 years after Old Fashioned. Dissing the scholarly community who “have not measured up well” and who use Twain’s novel “too often to score points about race,” Thomas places Huckleberry Finn within the complex history of Reconstruction meticulously detailed. 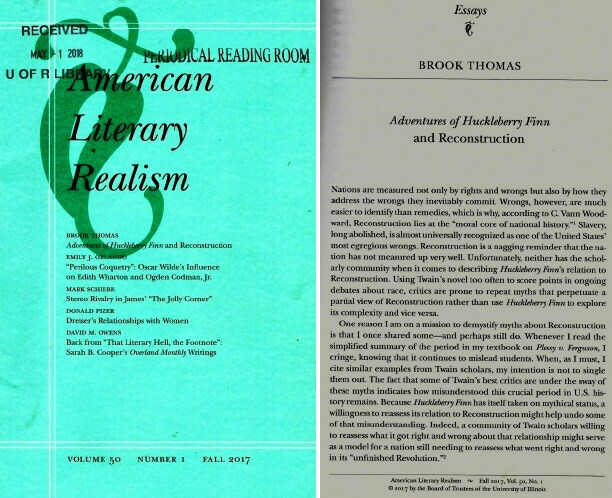 American Literary Realism, 1870 – 1910, Volume 50, Number 1, Fall 2017. Brook Thomas, “Adventures of Huckleberry Finn and Reconstruction,” pages 1 – 25. Scanned courtesy of Rush Rhees library. In the second paragraph, Thomas offers a rather disingenuous apology: “When as, I must, I cite similar examples [of misunderstanding Reconstruction] from Twain scholars, my intention is not to single them out.” Lounging in a comfortable couch with Messinger almost empty during intersession — my curiosity tempted, teased, and tickled — I wondered who Thomas would skewer. Alas, one of them was Andrew Levy who I knew from our undergraduate days at Brown University. Thomas is not kind: “If Andrew Levy’s Huck Finn’s America (2015) is any indication [of the apprehension of the scholarly community on the relationship between Huckleberry Finn and Reconstruction], we have a lot of work still to do” . . . “Levy, himself, in one paragraph makes at least three other misleading statements” . . .”We can see why such distortions matter when Levy comes to his conclusion.” Ouch. Lounging on the couch, I realized anew how perilous life can be on the cutting edge.